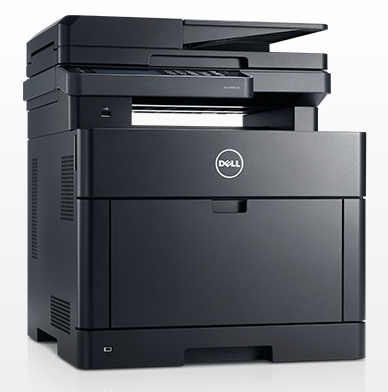 Print, scan, copy and fax with the impressive Dell H825cdw colour laser all-in-one printer. This robust model may take up little space but the H-825cdw laser printer boasts excellent features. It has quick print speeds and decent-quality resolution. Users can also easily print from and scan through the cloud. The Dell colour cloud multifunction printer - H825cdw is very accessible but also offers security features, including a PIN. This unit runs on 1GB of RAM and is powered by a 525MHz processor. Paper handling options are limited. The Dell H825cdw colour multifunction printer measures 16.9 x 19.8 x 19.7 inches and weighs 69.9lbs. This all-black model comes with a flatbed scanner and automatic document feeder as well as duplexer. For media handling, it has a 250-sheet paper cassette along with a 50-sheet multipurpose tray. A 4.3-inch touchscreen colour display is available for easy operation of the Dell H825cdw colour laser MFP. The fax machine has a modem speed of 33.6kbps. It also has a standard memory of 4MB to be able to save fax pages and 200 speed dial entries. Some of the fax features of the Dell H825cdw colour laser printer include delay in transmission to secure receiving. Print and copy speeds are quick at 30ppm / cpm on simplex and 19ppm / cpm on duplex for both monochrome or colour. This robust unit has a monthly duty cycle of 50,000 pages. The maximum paper handling capacity of the Dell H825cdw colour cloud multifunction printer is 850 sheets, even with the optional cassette.